If you are an Amateur of the decoration objects, you will not be disappointed! We present to you the fantastic new and beautiful lamps shaped like the jellyfish. Roxy Russell has created a superb Medusae collection, the hanging lamps produced using the laser cutting technology which particularly resemble jellyfish. Given the finest finishing touches, these luminous jellyfish seem to be come straight out of the Avatar movie. But of course, those are harmless ;-). If you want to get one, they cost from $ 325 to $ 425 per piece. 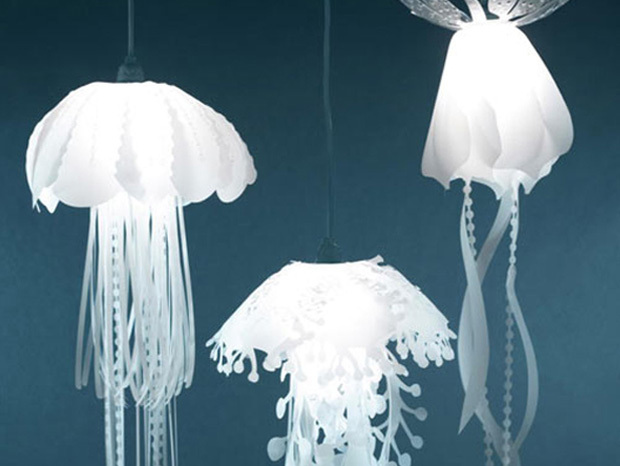 We are immediately charmed by these bright jellyfish and we would like ti decorate our home with them;-). What type of lamp would you like to have for your decoration?